The Supreme Court, while restoring a trial court order that dismissed a suit for specific performance of contract, reiterated that, in order to obtain a decree for specific performance, the plaintiff has to prove and establish his readiness and willingness to perform his part of the contract throughout. The Supreme Court, while dismissing an appeal against Gujarat High Court order, observed that recitals in the order sheet with regard to what transpired before the high court are sacrosanct. Observing that the discretion of the arbitrator to award interest must be exercised reasonably, the Supreme Court listed factors that must be taken into consideration by the arbitrator while awarding interest. The bench comprising Justice Rohinton Fali Nariman and Justice Indu Malhotra said that the award-debtor cannot be subjected to a penal rate of interest, either during the period when he is entitled to exercise the statutory right to challenge the award, before a court of law, or later. In a significant Judgment the Supreme Court on Thursday held that the Limitation Act is applicable to applications filed under Sections 7 and 9 of Insolvency and Bankruptcy Code From the inception of the Code. The two Judge Bench of Justices RF Nariman and Navin Sinha was examining the question ‘whether the Limitation Act, 1963 will apply to applications that are made under Section 7 and/or Section 9 of the Code on and from its commencement on 01.12.2016 till 06.06.2018’. A two Judge Bench of the Supreme Court on Wednesday re-iterated that the statement of an injured recorded under Section 161 of Code of Criminal Procedure can be treated as dying declaration admissible under Section 32 of the Indian Evidence Act. Bench of Justices AK Sikri and Ashok Bhushan was hearing an appeal against judgment of Orissa High Court dated 25.01.2017. Giving a purposive interpretation to Section 14(3)(c) of the Specific Relief Act 1963,the Supreme Court held that the said section does not bar a developer from seeking specific performance of development agreement against the owner of the property. The Supreme Court on Tuesday reiterated that in order to prove the offence of any public servant demanding and accepting illegal gratification, one has to necessarily prove the “twin requirement of “demand and acceptance of the bribe amount”. The Supreme Court on Friday dismissed appeals filed against Madras High Court judgment that had upheld the constitutionality of Section 19(11) of the Tamil Nadu Value Added Tax Act, 2006. While holding that ‘victims’ can file appeal without seeking leave to appeal, the Supreme Court made pertinent observations about rights of victims of crime. Justice Madan B. Lokur, in his judgment, observed that even today the rights of an accused far outweigh the rights of the victim of an offence in many respects and there needs to be some balancing of the concerns and equalising their rights so that the criminal proceedings are fair to both. The Supreme Court directed the state authorities to reconsider the candidature of a successful aspirant for judicial service, whose selection for appointment was cancelled on the ground of ‘moral turpitude’. A three-judge bench comprising Justice Kurian Joseph, Justice Sanjay Kishan Kaul and Justice Navin Sinha observed that there cannot be any mechanical or rhetorical incantation of moral turpitude, to deny appointment in judicial service simplicitor and there can be no arbitrary denial of appointment after empanelment. The Supreme Court observed that when a statute provides that cognizance of particular cause is to be taken by a particular court, no other court can take cognizance of the cause since legislature never creates or provides for parallel jurisdiction in two different courts for taking cognizance of a cause. The bench comprising Justice AK Sikri and Justice Ashok Bhushan though agreed with the high court that the Additional District Judge was not competent to decide the suit, but set aside its judgment after it noted that the tenant did not raise any objection as regards the pecuniary jurisdiction. The Supreme Court on Friday held that Urban Improvement Trust constituted under the Rajasthan Urban Improvement Act, 1959 is not a local authority within the meaning of Explanation to Section 10(20) of the Income Tax Act, 1961, in order to get exemption. The bench comprising Justice AK Sikri and Justice Ashok Bhushan set aside a Rajasthan High Court division bench ruling that had accepted the claim of the assessee that it is local authority which is entitled for exemption under Section 10(20) of the Act. The Supreme Court on Friday stayed the death sentence awarded to a Haryana woman and her boyfriend for poisoning and strangulating seven members of her family, including four children, in September 2009. The stay was granted by a Bench comprising Chief Justice Ranjan Gogoi, Justice Sanjay Kishan Kaul and Justice Navin Sinha against an order passed by the Punjab and Haryana High Court in July this year. The Supreme Court bench headed by Justice Kurian Joseph said when trial court proceedings are stayed, there is no need for the parties to be in court till the stay is vacated or modified by the court which granted the stay. The Supreme Court on Friday stayed the Uttarakhand High Court order banning Fatwas and barring religious outfits/bodies and statutory panchayats/local panchayats/group of people in the state from issuing such diktats. The order was passed by a Bench comprising Justice MB Lokur and Justice Deepak Gupta on an appeal filed by leading Islamic organisation, Jamiat Ulama-I-Hind. Senior Advocate Raju Ramachandran appeared for the appellant. The Supreme Court directed a husband to pay an amount of Rupees One Crore to his estranged wife, after she expressed that she was only interested in getting back her money, and not the continuation of marriage. The Supreme Court on Wednesday took note of the October 3 violence at Puri’s Jagannath temple during a protest against the introduction of a queue system for devotees and said no policeman should enter the temple with weapons and shoes. Taking stern view of the prolonged failure of a few States and High Courts in providing information on the establishment of Special Courts for trying cases involving legislators, the Supreme Court on Wednesday warned the Chief Secretaries and Registrar Generals of such States/UTs and high courts that they would be held personally liable if the information demanded is not provided within four weeks. The Supreme Court on Tuesday directed that the physically handicapped students before it, who had been denied admissions this year despite being meritorious, should be admitted in the MBBS course in a government medical college next year. The Supreme Court recently quashed criminal proceedings against a man based on the complaint by his brother’s wife alleging torture and harassment by him, after it found from his passport papers that he was not in India at that time. The bench comprising CJI Ranjan Gogoi, Justice Sanjay Kishan Kaul and Justice KM Joseph reiterated that in an appropriate case (proceedings under Section 482 CrPC) where the document relied upon is a public document or where veracity thereof is not disputed by the complainant, the same can be considered. The Supreme Court issued a notice to the Uttarakhand government and others on an appeal against a part of the Uttarakhand High Court order by which it had struck down the particular clause of government’s Nazul policy which allowed conversion of Nazul land in illegal occupation to freehold. In a significant step, the Supreme Court bench of Chief Justice Ranjan Gogoi, Justice S. K. Kaul and Justice K. M. Joseph on Wednesday ordered that an assessment of “Live transcription” technology be made for recording of evidence. The Supreme Court directed the police to seal nine properties of real estate group Amrapali where the documents required by forensic authorities are reportedly kept. The bench comprising Justice Uday Umesh Lalit and Justice Dhananjaya Y Chandrachud issued this directive as the counsel for these directors (Anil Kumar Sharma, Shiv Priya and Ajay Kumar) agreed to give an undertaking before the court that “all the documents are available at the above 7 plus 2 places only and that not a single document is kept at any other place”. In another blow to the three directors of the Amrapali Group sent to police custody, the Supreme Court on Thursday issued formal notice and directed the Registry to register a separate cause as “Suo Motu Contempt” against them for violating the court’s orders and interfering with the course of justice. The Supreme Court on Monday opined that it was “unfortunate and tragic” that the Centre had refused to make any payment towards the sanitation crisis arising out of the strike by sanitation workers of East Delhi Municipal Corporation over regular payment of salaries. Supreme Court on Monday issued notice to Centre and Election Commission Of India in a PIL seeking updation of National Register of Citizens for State of Tripura, and deportation of alleged illegal immigrants. The Bench of Chief Justice Ranjan Gogoi and Justices Sanjay Kishan Kaul and KM Joseph asked the registry to tag the matter with Assam NRC case. The Supreme Court bench of Chief Justice Ranjan Gogoi, Justice S. K. Kaul and Justice K. M. Joseph on Monday required the Reserve Bank of India to convey its decision as to the lowering of floating rates for loans to the advantage of the consumers. The Supreme Court on Monday sought the Centre’s response to a PIL accusing the government of deploying the outdated 2G network in Arunachal Pradesh and in two districts of Assam—Karbi Anglong and Dima Hasao—at a huge cost in complete contrast to its ‘Digital NorthEast 2022’ policy. The Supreme Court on Monday sought the Centre’s view on the establishment of a national-level body/institute for the purpose of child protection and rehabilitation. The bench of Justice Madan B. Lokur and Justice Deepak Gupta was dealing with the unfortunate episode in which 34 girls were allegedly raped and sexually abused in a shelter home run by a NGO at Muzaffarpur in Bihar. The Supreme Court on Tuesday sent three directors of the Amrapali group to police custody, directing them to hand over all the documents of the 46 group companies to forensic auditors. A bench of Justices Arun Mishra and U U Lalit took exception to the Amprapali group not handing over all the documents to forensic auditors and said that they will remain in police custody till they hand over all the documents. The Supreme Court declined request for early hearing of the review petitions filed against the Sabarimala judgment which allowed entry of women of all age groups to the temple. “The review petition will be listed in the usual course”, said the CJI Ranjan Gogoi, in response to the mentioning made by Advocate Mathew Nedumpara, who requested for an early hearing of the review petition before the SC closes for Dusshera vacation on October 12. The Supreme Court dismissed review petition filed by National Lawyers’ Campaign For Judicial Transparency & Reforms against the judgment laying down guidelines for designation of Senior Advocates. The Supreme Court bench of Chief Justice Ranjan Gogoi, Justice S. K. Kaul and Justice K. M. Joseph on Wednesday expressed its wish to be apprised by the government of India of the steps in the decision making process followed in the controversial procurement of the 36 Rafale fighter jets from France. The Supreme Court issued notice to the Kerala government, the Travancore Devaswom Board and the Cochin Devaswom Board on petitions moved by TG Mohandas and Subramanian Swamy challenging the Government taking over the constitution of the two Boards which administer most of the temples in Kerala falling in the erstwhile Travancore-Cochin part of the State and demanding democratic participation of devotees in administration of temples. 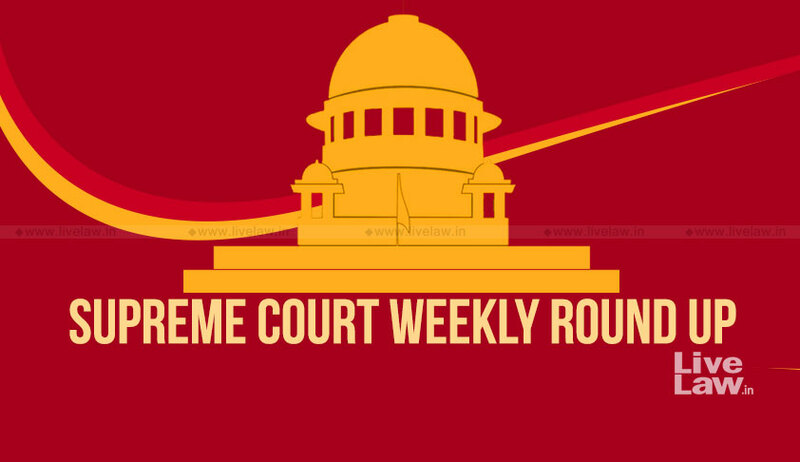 The Supreme Court bench of Justices Madan B. Lokur and Deepak Gupta on Friday issued notice on the plea against the refusal of the Calcutta High Court to interfere with the West Bengal state government’s decision to assign Rs. 10, 000 each to the 28000 Durga Puja organising committees. According to the State Government, the fund is meant for community policing activities like assisting the police through volunteers in Safe Drive campaigns, maintaining sanitation and public safety in managing crowd during puja festivities. The Supreme Court dismissed the petition filed by Congress leader Kamal Nath for random verification of Voter Verifiable Paper Audit Trail(VVPAT) machines in the upcoming Assembly elections in Madhya Pradesh. The Supreme Court ordered status quo to be maintained with respect to alleged illegal shed in a 50-year-old restaurant in Mumbai’s posh locality Ville Parle (West) while directing the trial court to decide expeditiously the civil suit initiated by the restaurant against the demolition order of the Municipal Corporation of Greater Mumbai.